Houghton Mifflin Harcourt, 9780618574780, 320pp. * La Brea Tar Pit Chicken Wings -- easy-on-the-host finger food that will be the talk of your party. * Cream of Cauliflower Soup -- kids at the private school where this soup was served for lunch actually begged their parents to get the recipe. * Spaghetti with Slow-Roasted Cherry Tomatoes -- a Boston chef's favorite at-home supper, terrific all year round. * Spiced Skirt Steak -- nothing easier, nothing better. * Bok Choy with Shiitakes -- you can make this in less time than it takes your guests to find their seats. * Brown Sugar-Sour Cream Cheesecake -- if this isn't the best cheesecake you've ever tasted, we'll eat this book. 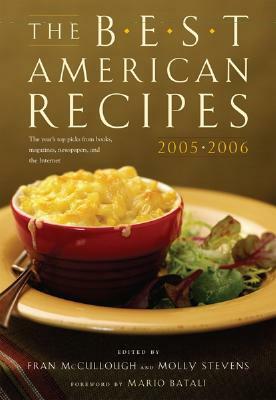 Fran McCullough has discovered, edited, and published many of the country's most distinguished cookbook writers. She is the author of the best-selling Low-Carb Cookbook and of Living Low-Carb, The Good Fat, and Great Food Without Fuss, which won a James Beard Award. Molly Stevens is the James Beard and IACP Award-winning author of All About Braising, the coauthor of One Potato, Two Potato, and a contributing editor for Fine Cooking. Mario Batali's award-winning restaurants include Babbo, Lupa, Esca, Casa Mono, Otto, and Bistro du Vent. He is the star of the Food Network's hit Iron Chef America. He also hosts two shows on the Food Network, Molto Mario and Ciao America with Mario Batali. His latest book is Molto Italiano: Simple Classic Italian Recipes to Cook at Home.